Looking back on the year, Holt Brothers Inc. achieved some major milestones. At the top of the list is the team we have assembled at Holt Brothers Construction. When Torry and I were exploring construction as a potential business, the first response we got from people was: “Are you guys crazy?” Keep in mind, this was right after the great recession when many construction firms were starving for work or going out of business. We saw it as an opportunity. We doubled in size this year, hiring Mike Pritt, a 20+ year veteran with expertise in pre-construction, an area we needed to boost to grow. We hired Carla Jackson and Jonte Harris, two young and talented induviduals who are eager students. Durga Vejella, a recent graduate from NC State’s master’s degree program in civil engineering, joined the team full time. They complement a group of seasoned professionals – Leonard Barrier, Tony Davis, David Creech, and Monty Freeman – who joined us the previous year. And then there’s Debra Barrier, who keeps our house in order. We won, with Clancy & Theys and Balfour Beatty, the City of Raleigh’s Critical Public Safety Facility, a $65 million project – a high profile and vital project for our city; added WakeMed to our client list; completed a mentoring program with McDonald’s; and joined Danis as a mentor/protégé on the $40 million Reynolds Coliseum / Hall of Fame project at NC State. At Holt Brothers Foundation, we hired Mary-Ann Baldwin as our new executive director. We wanted a local presence, someone who could help us raise money and our profile. Already, we’re off and running with a new fundraiser – our first ever Playoff Party on January 19. The response from our friends and partners in the Architecture / Engineering / Construction industry has been amazing. Our hope is to expand programs that support children who have a parent with cancer. It’s a mission that truly resonates with people and it’s very personal for Torry and me. We also continued what is becoming a great tradition – working with Harris Teeter and the Food Bank of Central & Eastern North Carolina on a Thanksgiving program to feed the hungry, ensuring that families enjoy a special meal on this day of gratitude. What we’re most excited about is landing on the cover of November’s Business North Carolina magazine, the state’s premier business publication. 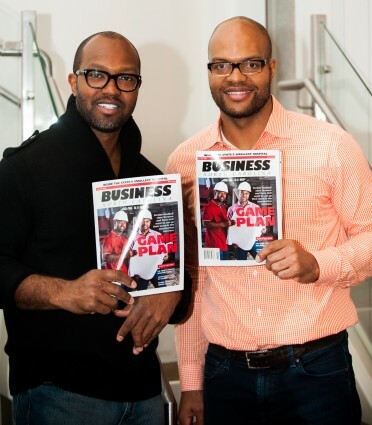 The in-depth article really legitimized our construction company as we transition from the NFL to our next goal: becoming successful entrepreneurs. On a personal note, I was named to the Greater Raleigh Chamber of Commerce’s Board of Directors and asked to chair Wake Education Partnership’s Annual Fundraising Campaign. Both of these are great leadership and learning opportunities for me. And they allow me to give back to the community – something Torry and I are passionate about. I also had the opportunity to visit our US troops in Djibouti, Africa, which was a rewarding experience. You appreciate what you have when you see the sacrifices our troops make for all of us. While the year was positive for us, it was not completely void of miss hits, close calls and disappointment. However, we learned some valuable lessons from these experiences and those lessons will be subject for another post at another time. We want to thank our dedicated team, our clients, our industry partners, our fans and everyone who has helped us, advised us, and worked with us in 2013. We look forward to 2014 – a year filled with new successes, new challenges, and new opportunities. Wishing you all the best.